This page provides news on working operation of steam locomotives, construction of new steam, technical improvements to existing steam locomotives, and similar news items. See the Steam News Archive for older news stories. Former South African Railways 4-8-4 no. 3450, best known as "the Red Devil", was moved from its storage location to Worcester Depot in March 2018, where it has been undergoing restoration. This locomotive was extensively modified by David Wardale in the early 1980's as part of an effort to keep steam in service in South Africa. Unfortunately, this effort was unsuccessful but no. 3450 was very successful in service and set several new records for power and efficiency. The Red Devil now belongs to Transnet, the South African freight operator, and is part of their heritage fleet. The locomotive had last operated in 2004. No. 3450 is now leased by Ceres Rail Limited who completed the restoration. Following the restoration, the locomotive was successfully operated on 4 July 2018, and it is planned to use it on upcoming passenger excursions. After Wardale left South Africa, 3450 continued to operate for several years but unfortunately several of the key modifications were gradually undone over the years. The main remaining improvements that appear to still be in place are the double Lempor ejectors (although the Lempor exhaust nozzles have been replaced with conventional round nozzles with bridge bars), enlarged steam chests on the cylinders, and the over-fire air openings for the GPCS. An article at the Advanced Steam Traction Trust posted on 13 July states that Ceres Rail Limited hopes to restore at least some of the removed modifications to the locomotive during the dry season when coal-fired steam operations are not allowed. Photos of the work have been posted to several Facebook groups, including "Footplace Memories", a South African group for former railroadmen. The Pennsylvania Railroad T1 Steam Locomotive Trust, a group building a new, replica 4-4-4-4, continues to make impressive progress on the construction of this locomotive. 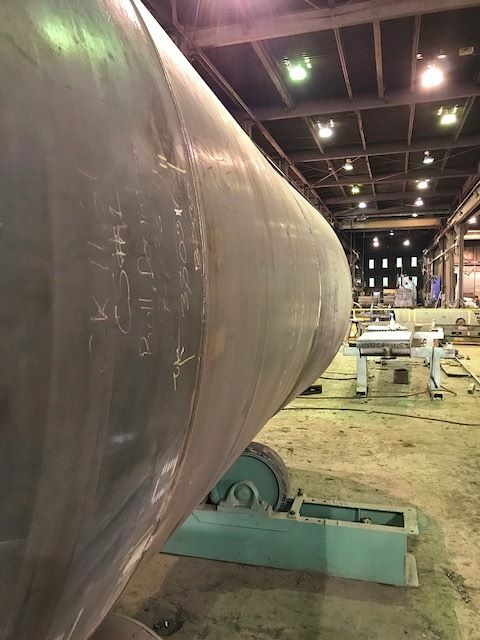 The latest photos posted show the first three courses of the boiler complete and welded to one another. Previous photos showed completed front and rear flue sheets, as well as several driver centers, the cab, and the "sharknose" prow for the smokebox. Other significant parts are already on order, and design work for the frame is well underway. JAKTOOL Engineered Solutions, located in Cranbury, NJ is donating the engineering effort for design of the new frame. The frame represents a significant engineering and fabrication challenge as the facilities and skills necessary to replicate the original one-piece cast engine bed are no longer available. The new frame will likely be built by welding together several separately cast sections, which should provide a superior frame to the original. The group has also acquired the sole remaining 8-axle Pennsylvania Railroad "long distance" tender, originally used behind an M1 4-8-2. The upper section of this tender will be modified to match those used behind the T1's. Availability of this tender in relatively good condition represents a huge saving in effort and money for the group. Read more at the group's webpage at https://prrt1steamlocomotivetrust.org, or follow them on Facebook. Reports on steam modernization projects from around the world have shown up recently. Dr. Jos Koopmans recently designed a new exhaust system for 4-6-0 no. 6023 King Edward II in the UK and another for Essex Terminal 0-6-0 no. 9 in Canada. Both these locomotives are reportedly performing well. DLM recently commissioned an oil firing conversion to Puffing Billy Railway 2-6-2 14A in Australia. The oil firing system is similar to those fitted to the new construction 0-4-2T rack engines built by DLM predecessor SLM in the 1990's for service in Switzerland and Austria. The Lempor exhaust system previously fitted to 2-6-2 6A by Nigel Day was moved to 14A as part of the conversion. A second "austerity" class 0-6-0T, no. 19, was fitted with a Lempor exhaust at the Scottish Railway Preservation Society in the UK. No. 7 was previously fitted with a Lempor a few years ago. The performance of both locomotives is reported to be significantly improved with the new exhaust systems. Rob Dickinson's "International Working Steam Locomotives"